Hey, we all love a wager. Particularly Kevin in the TV show the US Office. He would, given the opportunity, bet on a snail crossing the road. Funny guy. There’s nothing quite like the feeling of having five euros or dollars or whatever on Devin Hester to score the opening touchdown of the Superbowl against the Colts, at 10/1. There’s nothing quite like having even that one hard earned euro or dollar on the Boston Red Sox to win the 2004 ALCS when 0-3 down, at 100/1. There is nothing at all quite like backing the great Zu Zu Zidane to score two or more goals in the World Cup final, and for the majestic French artist to realise your dreams for you with two crackers. Sports betting can be enjoyable and a thrill. Of course, if you are reading this in the States, your movements are restricted on this front. You can buy a semi automatic weapon, but you can't place a considered adult wager on a sporting event. Kind of a head scratcher, no? Maybe, as a resourceful individual, you have figured out a way around this. Either you live in Nevada or you know a guy who knows a guy called 'Vegas Bob' who can get this kind of thing done. This is all well and good, however, there are just some people that should never gamble. Call them unlucky, call them whatever, they should simply never bet. On anything. Ever. As always, we are here to help. How can you tell if you are one of these individuals? Simple. If you sound like any of these people, then put that docket down, and step out of the bookmakers. If you think you are Wayne Rooney, you should not be gambling. Rooney's gambling 'exploits' are the stuff of legend, for all the wrong reasons. So very wrong. When Rooney first started getting paid massive figures on a weekly basis as a cherubic young lad at Everton, he embarked on a horrible, losing gambling spree. His losses were so bad that one bookmaker eventually wrote to him and asked him to stop placing wagers with them. Think about that for a second. The bookie banned him, not for winning, but for losing too much. 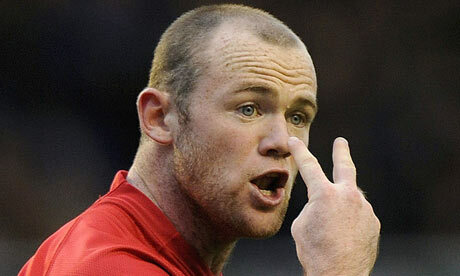 If you think you are Wayne Rooney, stop gambling! You bet on virtual racing. Can you believe people actually do this? This is the single dumbest venture since Napoleon thought to himself, 'You know what, I kinda fancy a trip to Russia this winter' Amazingly, as the late great Richard Pryor would say, people are all into that ****! Walk into any Irish bookie any time of the day and there’s guaranteed to be three or four guys staring blankly at the screen, watching computer animated horses sprint around a computer animated track. If you bet on virtual racing, you should not be gambling at all. Occasionally, people like to pick out a player to score the first touchdown of any given NFL game. Take for example the Jets/Patriots playoff game not so long ago. If you are prone to the odd wager, and someone said to you, ‘who do you think might score first in this game?’ you might have replied, ‘Possibly Wes Welker, Ladanian Tomlinson or maybe Ben Jarvus Green Elllis’. All decent suggestions. One hardy soul in the UK decided to place his hard earned cash money on none other than Patriots Tight End Alge Crumpler. Blocking, Tight End, Alge Crumpler. The fact that this person was a producer on the UK Sky Sports NFL show, meant we all got to share his pain. If you recall, Crumpler dropped a sure touchdown pass early in the game. Clunk. The presenters, Nick Halling and Kevin Cadle, found out quickly, and let the rest of the world know. ‘The Guy’, as we’ll call him, got 50/1. Of course he got this for a reason. Crumpler, at this stage of his noble career, has hands like big clumsy rocks. The whole incident led to the brilliant Cadle moment of all moments, as they cruelly replayed the incident over and over, and Cadle chanted, ‘Watch the money, watch the money, watch the money drop….now!’. Cruel but hilarious. Bottom line? If you ever place a wager on Alge Crumpler to catch a touchdown pass, you should not be gambling. Unless you were hiding under a rock all week, or more stoned than James Franco, you will know Ireland stunned the cricket world by defeating England in the ongoing Cricket World Cup. Some are saying it is the greatest upset in the sport. Ever. Meanwhile, Betfair, the online bookmaker which pits punter against punter, reported that over £2.5 million was placed in total on England when they were winning, and their odds were the minimum available, 1.01. So, for example, if you put £1 on them at those odds, and they won, you would receive £1.01. I guess every little counts, but, c’mon, man! If you are reading this and you happen to have been one of those backing England at 1.01, then you need to reassess things a little. For a start, quit gambling. Finally, as always leaving the best to last, if you have ever, ever backed the Washington Generals basketball team to win a game, well, you know the rest. The Generals are the proud owners of a 6-13,000 win/loss record. That’s not a mistake. They spent decades as the foil to the Harlem Globetrotters exhibition team. Well, you could argue that their six wins to date shows they can actually win, and you would have to assume their odds are pretty decent, but, seriously, what’s the point? Ask yourself, have you ever backed the Washington Generals? If the answer is yes, then you Sir or Madam, you should never, ever be gambling. Ever!